Doctor Who fan Emma Young made this Cyberman feeder for her backyard. 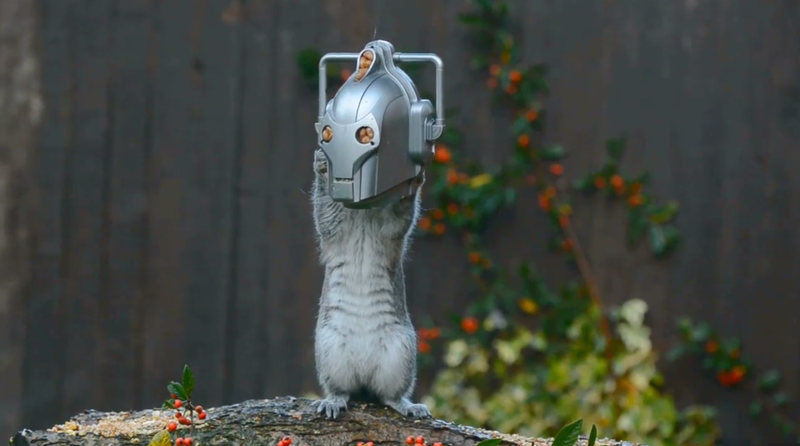 Forget any other plan the baddies have ever had in canon, the Cybersquirrel is by far the scariest. Where would you even hide from a hundreds of upgraded squirrels? Young said, "My whole family love Doctor Who so I decided to create a sci-fi feeder. I packed a sticky mix of nuts and peanut butter into the head." The squirrels were initially cautious (AS WELL THEY SHOULD BE) but, says Young, the smell of food proved too much for them. "It was hilarious to watch. Well worth all the time and effort." Here's the video of the doomed little fellow.